Why is it that Glock discontinued all their pistols that have built-in compensated barrels, and vented slides to match? Ah, well, I got mine, and it was made just before the August discontinue date. My friends tell me that ported barrels aren't allowed in IPSC sanctioned matches, though local matches will let you shoot them, being happy that you showed up and paid the entry fee. But that's OK. The mix-and-match nature of the Glock platform, and third-party companies like Lone Wolf Distributors come to the rescue. The 22c, the ported Glock I have, which is in .40 S&W, can easily be changed over to a non-ported pistol in the cheaper-to-shoot 9mm Parabellum caliber, with the simple addition swapout of the barrel with a Lone Wolf 40-9 conversion barrel. They also have a threaded version, if you've got a suppressor, which Ol' Backwoods doesn't. Even so, Lone Wolf even has a nice flash suppressor for the threaded conversion barrel. That Wolf conversion barrel is pretty cool-looking. There's a picture there, for ya to take a gander at. Wolf slightly tunes the chamber headspace so that the stock .40S&W ejector works just fine. Folks swear up and down they have no malfunctions with the barrel. They do recommend 9mm mags, but I hear tell of people shooting the .40 S&W mags with 9mm in them, with minimal malfunctions. Better to be reliable, though, and get the 9mm mags. Why buy a conversion barrel? 9mm is cheaper than .40. Just checking BulkAmmo.com for FMJ practice rounds, American Eagle is 46.5¢ per round for .40 S&W, and 41¢ per round for 9mm. That's enough of a difference to pay for the barrel after only 1818 rounds, which is a few weekends at matches! For even more savings, I could shoot lead, moly-coated and/or copper-washed bullets that I reload myself, as the Lone Wolf conversion barrel is broach-cut instead of Glock's polygonal rifling, which doesn't work well with non-jacketed bullets. Another cool thing is that I can train in 9mm, a lower-recoil caliber, but carry +P loads of .40S&W, which has a marginally higher kinetic energy than even defensive 9mm rounds. All while maintaining exactly the same feel and trigger pull as my standard carry gun. Two weapons in one. Ol' Backwoods is also considering some other replacement parts and add-ons for my Glock 22c. One is a 3-1/2 lb trigger connector from Lone Wolf Distributors. This brings the standard 5-lb Glock trigger pull down to 3.5 lb. That's well within the pull range of single-action pistols. It's a trigger job for $13.50. Or, how about an extended magazine release for $2.69? And maybe an extended slide release, which is actually a Glock factory part. Or some rubbersized grip enhancers. 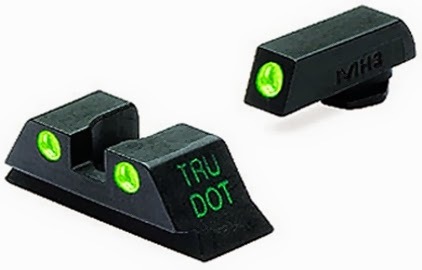 Stepping up a bit, how about the Meprolight tritium-powered night sights, like the ones at right? 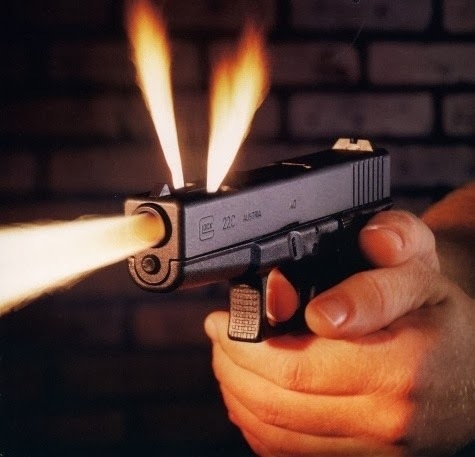 Or even a Streamlight TLR-3 Flashlight, which fits right on the Glock rail. Except for night-sights and the flashlight, these add-ons are all under $20. And, heck yeah, I want a 33-round 9mm magazine. Just to tweak the gun grabbers. These modifications and add-ons illustrate why I like the Glock: similar to the Stoner AR platform, it can be modified, mixed and matched to suit personal taste and 'philosophy of use' (to use a Nutnfancy term), while still retaining high reliability and conforming to its standard manual of arms. UPDATE: After the break, there's a YouTube video I found (by DocTacDad) that is a side-by-side comparison of the Glock 22 (uncompensated) to the Glock 22c. Looks like you lose about 25 fps, and 6% of the energy, to the barrel porting. But, he estimates about a 30% reduction in muzzle flip, traded for larger sonic concussion. Also, he has another video, which I placed below the other one, that shows a Glock 22c with the Lone Wolf 40-9 conversion barrel. Nice to see it in action!